These are highlights from our session at the World Social Forum in Tunis titled “Global Solidarity Against Water Grabs by Dam and Mining Projects.” We had interventions and case studies from people affected by dams in Turkey, Iraq, and India; and communities affected by mining in Mexico and Peru. Claudia Campero a local organizer from Mexico and working with the Blue Planet Project moderated the session. The stories shared the same themes: destruction of nature, devastation of communities, power struggles, and greed for profit. Dams and mining projects have common threads. They are frequently carried out without free, prior, informed consent of local populations. Their social and environmental consequences are huge. They lead to control of vast amounts of water by project operators, mostly transnational corporations. They disturb the water cycle of entire regions, putting the livelihoods of many at risk. Frequently rural communities are displaced. All this is a form of violence that includes loss of community ties and trust, defamation of those who resist, sexual violence, beatings and even murder. These issues must be confronted wherever struggles against dams and mining are ongoing. And all too often the activists find themselves criminalized. 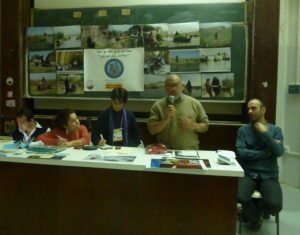 Ercan Ayboga from the Initiative to Keep Hasankeyf Alive gave a general overview of dam mega projects. Dams are one of the most controversial infrastructure projects around the world. More than half of our rivers are dammed, with over 50,000 large dams and about 5 million small dams.Today the biggest dam builder states are China, India, Brazil and very interestingly, Turkey and Iran. According to the World Commission on Dams, 50-90 million people have been displaced by dams. 500-600 million people living downstream have been affected. 80-90 percent of displaced people end up in poverty. In many instances governments end up with more debt than was forecast for a dam; and this is before the cost of environmental and social impacts are taken into account. Dams are used as an icon of development and clean energy. Yet, dams male a large contribution to greenhouse gases, they emit methane, which has 20 times more heating capacity than CO2. Ecologically, rivers are the most bio-diverse ecosystems with two-thirds of species found in rivers. Water quality is affected when water is stored in reservoirs. Politically, the Ilisu dam is used as a tool to undermine the local struggle for autonomy. Criticism of the dam is equated with terrorism. The area where the dam will be built will affect historical and cultural sites that are more than ten thousand years old. The struggle for Hasankeyf in Turkey has being fought on many fronts: a big international campaign made the European export credit agencies withdraw their support for the project in 2002. On the legal front: two months ago a Turkish court ruled that the project had to stop because it was in violation of Turkish environmental law for not having an Environmental Impact Assessment. While the Turkish government appealed the court decision, saying that the project didn’t need one because the law was approved after the project had been conceptualized. The effect of the court decision has been to slow down the construction. 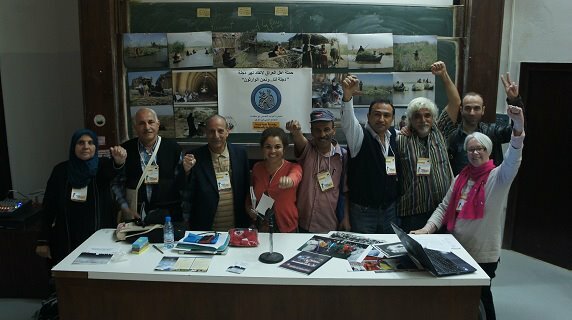 At the same time in Iraq, civil society has come together on a regional advocacy campaign with members from Turkey, Iraq, and Iran in a campaign to “Save the Tigris and the Iraqi Marshes”. The campaign works to raise awareness about the negative effects of the Ilisu dam in Hasankeyf in Turkey and on the local communities and water resources in Iraq. Salam Taha, from the Iraqi People’s Campaign to Save the Tigris explained that water flow to Iraq could be reduced by 50% if the dam is completed. That will affect both quality and quantity of water coming to Iraq, as well as increase unrest inside Iraq’s already volatile political situation. Further downstream, the marshlands of southern Iraq are also in danger. They are home to the Marsh Arabs and have global significance for their biodiversity and more than 5,000 years of history. They are home to numerous bird, mammal, amphibian and reptile species, many of which are globally threatened. The Central Marshes are currently being considered for UNESCO World Heritage Status and for National Park status. This valuable, unique, irreplaceable part of the world will likely be lost forever if the Ilisu Dam is completed. 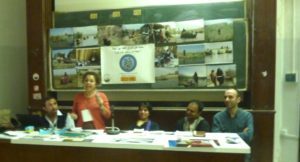 Johanna L. Rivera, from ICSSI and the Save the Tigris Campaign Coordinator explained that their campaign works to bring the issue confronted in Turkey and Iraq to the international community and to link it to the global struggle for water justice. On one hand Iraq is in a vulnerable situation as a downstream country, with virtually no negotiating power and no say on the decisions of the Turkish government. On the other hand, the volatile and sectarian nature of the government makes it difficult to make unified demands. The campaign efforts included an open letter to the Iraqi government to look seriously on the issue of the Ilisu dam and to take concrete steps to protect water resources in Iraq. Additionally, the campaign wrote a letter to Andritz company regarding their involvement in the dam construction and equipment supply. Andritz is involved in other mega-dam projects like Belo Monte in Brazil and Xayaburi in Laos. The campaign is calling for a transboundary agreement concerning sharing the water of the Euphrates and Tigris basin between the riparian states of Turkey, Syria and Iraq. Our colleague Guillermo Rodriguez, from the Assembly of “La Vida” spoke about Caballo Blanco’s case in Mexico. Guillermo, started by saying that dam and mining struggles are interrelated and is “urgent to maintain resistance because these are long and tiring struggles”, as he described the fight “against transnational corporations and corrupt governments” that impose these projects on communities. Indebted governments are often corrupted by transnational companies to impose their policies and perpetuate the extractivist model. Gold Corp who has business in Mexico worth 90 billion dollars spends about 1 billion to influence the local government. “The key is the precautionary model, to stop these projects when there are rumors, when the men in suit come to the community or the engineers come with their measuring instruments”. Guillermo Rodriguez, mexican activist from Caballo Blanco community In Veracruz, a Canadian corporation, Gold Group wants to install a mining project called Caballo Blanco, that intends to extract 1 ton of gold in 7 years; resistance in Rodriguez’s community has prevented this mining project from starting, but it is not defeated because the government concession to the mining industry is for 50 years. Guillermo, a community organizer for more than 50 years said, “We had learned from our Peruvian brothers that water is more important than gold”. The zone where the project will be established will destroy a mesozoic zone where there is a unique type of palm which grows 1 meter every thousand years. The forest is now 5 meters that means about 5000 years. A biodiversity of 230 species of mammals with 500 different species of vegetation, orchids, bromeliads and a phenomenon that we call “bird river” with more than 5 million birds from Canada and U.S. travelling to South America during the migration season”. Above all we learned that the struggle is long, because the mining and dam projects are destroying lives. We have taken this message to the indigenous communities and they have understood that they have to defend their territory. We heard from our colleague in India, Madhuresh Kumar, from the National Alliance for People’s Movement where they have been fighting against dams for more than 20 years. Madhuresh Kumar shared some lessons learned from the Indian movement and the Narmanda movement for over 27 years. He spoke about a “Battle of Ideas”; the need to create a counter narrative to all these mega-projects that are sold as development. We need to ask the questions: Development for whom, at what cost and how? Who decides how development takes place? He talked about the need to create linkages with people fighting for other struggles and create a national network. In India, what proved effective was to create a counter-narrative to the government development propaganda. That took 20 years, but the key was to build linkages nationally with struggles for other rivers, for environmental, governance, and anti-corruption; eventually they created a national network. Fighting one project is one thing but to deconstruct the whole development project you need to win the ideological battle. Take very radical positions: “No Big Dams” and engage others in the discussion on how to do development, and on questions of democracy. Any movement is not only about affected people, is a battle for the whole country. You engage all professional classes: teachers, lawyers, artists, filmmakers, musicians, journalists. Then you push your ideas through the whole society: someone makes a film, another writes an article, suddenly, there is a professor teaching your ideas at university, friendly bureaucrats and judges. So there is a domino effect that reaches the whole population. Narmanda Action committee was established in 20 countries and as a result the movement was successful in ending World Bank support for the project in 1993. Lastly, he mentioned the importance of tools like foreign solidarity to let governments know that the international community is watching; local struggles need to avoid being isolated from one another because we are fighting a global struggle. Nicanor Alvarado from the “Plataforma Institucional de Celendín” in Peru talked about the struggle against mining projects in Cajamarca. He said that what happens in Peru happens throughout all Latin America. You might have heard about the “Conga Conflict”, an emblematic conflict in all Latin America and the world. In the North Andes in Peru, indigenous peoples, the Quechua and Aymara, are leading a fight that has seen more than 300 leaders from indigenous communities murdered. The state and the corporations work together against the indigenous people. In Peru we are organized and we have established a permanent mobilization in the form of environmental defense fronts or “rondas campesinas” to protect the environment . Last year we had the Walk for Water where more than 100,000 marched and took over Lima and we defeated one of the biggest American corporations: Newmont Mining Corporation. When we go out on our mobilization, we say goodbye to our families and we take with us nurses and stretchers because we don’t know who’s coming back, is like we were going to war. Waiting for us at the mining site are 1000-2000 elite forces to shoot us; and they shoot us. In 2009 we had 350 wounded and in 2012 we had 35 dead, 5 of them indigenous leaders and 90 wounded. They wanted to scare us, but that’s when we overthrew the second council of ministers. We have learned that the mobilizing and unifying agent of social movements and political parties in Peru is for the defense of the land, of our water and our territories. That is the articulating agent and from there we have started to develop a program, a political proposal and hopefully in 2016 an indigenous environmentalist will come to power in Peru. This is our desire and we are working for that. Only then we will uproot the extractivist model that leads to the death of the planet. We have to globalize the struggle, the transnational power groups have globalized their capital; why can’t we globalize the struggle? The people from the West and the North cannot remain silent about their transnational corporations, it is not like 500 years ago. Today, the poor from South to North have to fight together against this monster. The last struggle of mankind will be fought for the planet and for the Amazon. The proposal is to radicalize democracy and to move to a post-extractivist model.